Smile, You’re on Jeffery Camera! My husband is a phenomenal graphic designer as well as photographer and we will be posting some of his work for you to enjoy. We love going to neighboring areas and taking photos while delving into the history of it. We hope you enjoy the photos as much as we enjoyed the adventures to take them! Enjoy! 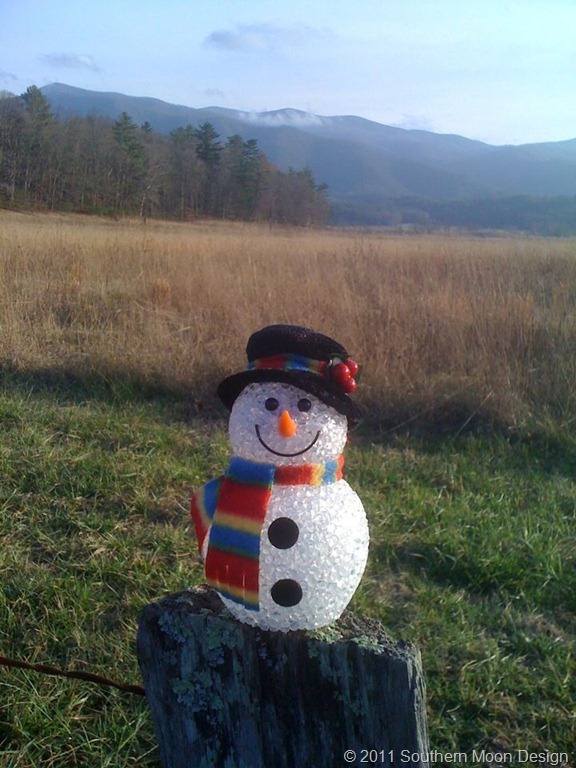 These photos were taken at Cades Cove in Smoky Mountain National Park. This bear walked right in front of us on Sparks Lane. If you’re a frequent visitor to the park, you’ll know that this is where a LOT of blackberry bushes are. 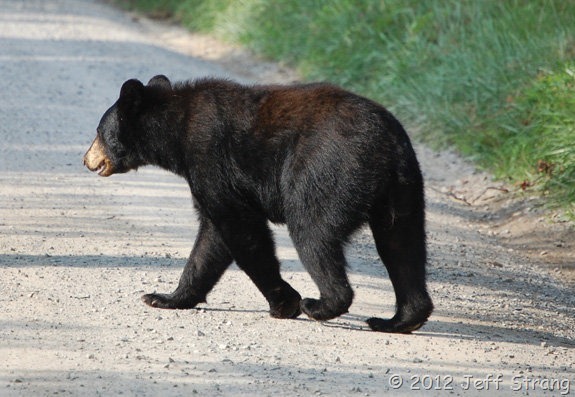 And during blackberry season, it is one of the best places to see black bears! Beware, though. Don’t get too close and do not disturb the bears! Admiring them from a distance with an awesome lens is the best way to enjoy them! 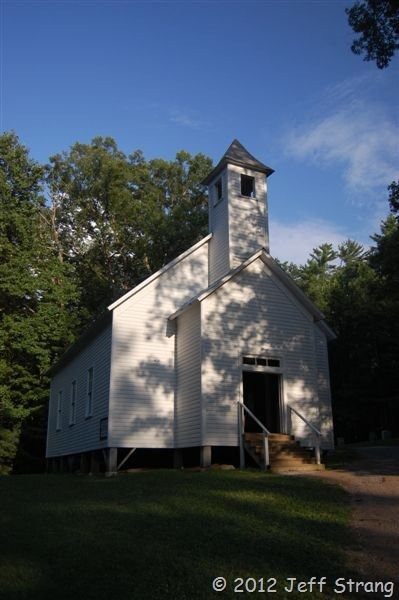 Throughout Cades Cove there are churches and cabins. All reminders of the small community that actually lived there for many years. This is one of my favorite photos of one of the churches on the Loop. It reminds me so much of the chapel where we were married in on nearby Bluff Mountain. Nothing like coming up on young bucks grazing in the tall grasses in the Cove. We love the occasional treat of “running into” one of these gorgeous creatures. We always find it difficult to contain our excitement, but somehow we manage to stay calm! Being in the presence of these beautiful creatures just takes the words out of my mouth! There are none that would adequately describe these moments! Let your eyes take it all in! 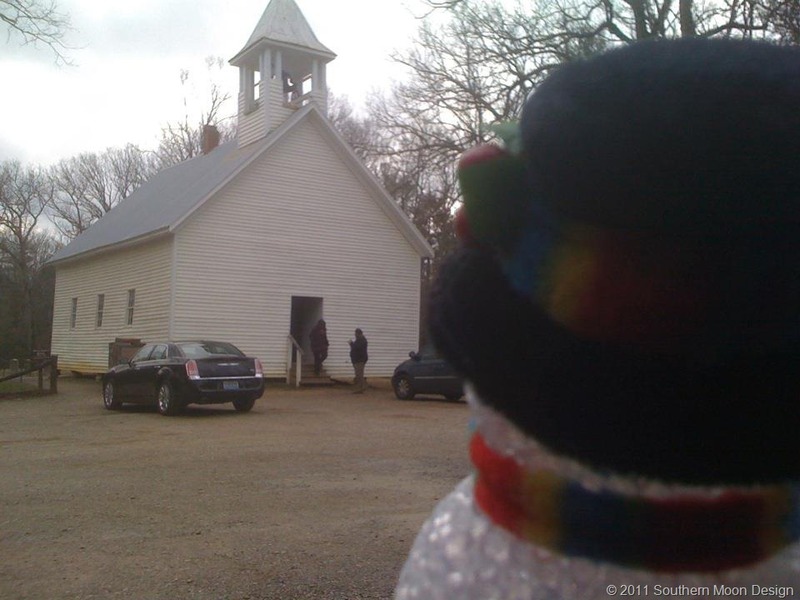 Christmas Day Frosty came to visit and we decided to take our friend back to a place that is very special to all of us. If you’re looking for a great day trip for the family or a great place to take visiting friends and family, Cades Cove, in Smoky Mountain National Park, is one of the best places to go. 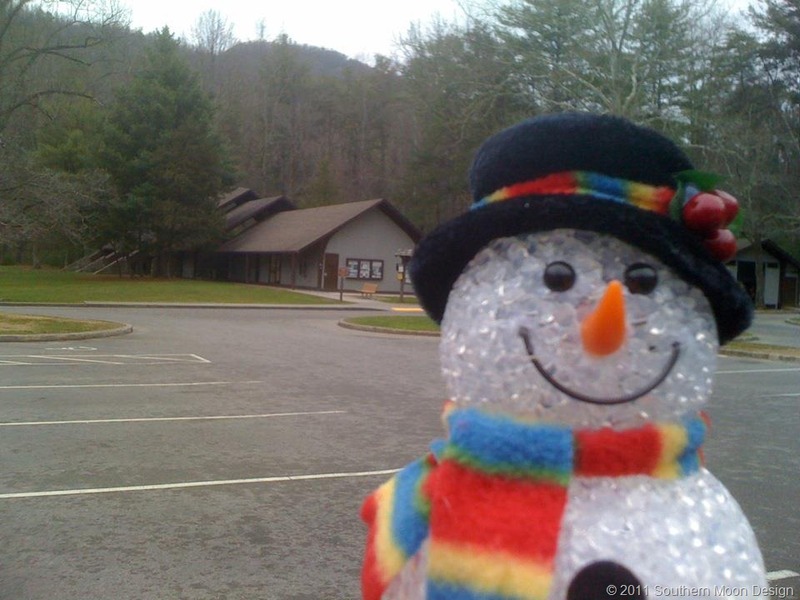 Once Frosty heard about the idea, he was excited to go and couldn’t wait for us to get there. Cades Cove is a short drive from Sevierville and Pigeon Forge and there are a couple of ways to get there. But we feel that going up over the mountain through Wears Valley into Townsend is the quickest way from Morristown. Just 7 miles from the fork in the road near Townsend, the winding road takes you up over the ridge into Cades Cove. It’s a beautiful drive no matter what time of year you go. 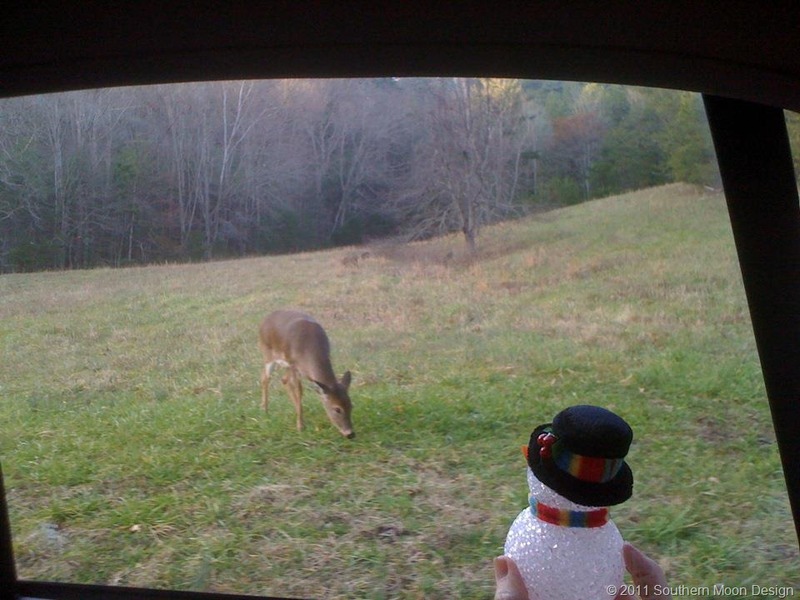 Frosty reminds us to remember our camera so that we can catch the wildlife up close and personal. There is a fabulous picnic area set under the trees. You can bring your portable tents to create extra shade in the summer or simply picnic under the trees. There are outside grills available for your convenience and public restrooms close by. Before heading around the Loop, we always stop by the campground store. There is a really nice camp store that sells the most fabulous soft serve cones for just a couple bucks. You can also get drinks and quick snacks as well as souvenirs. There are vending machines but they don’t always work. We find that we end up donating to the Park more often than getting a drink out of the machine! There is plenty of parking by the camp store so if you have a group of friends who want to all ride in the same truck or van, this is a great place to meet and leave their cars while you all go around the Loop together! Next to this parking lot is the campground itself. There are sections for RVs, tents and group camping. Right now parts of the campground is closed for the season, but during the summer the drifting scent of burning fires lifts through the air. There are trails all around both for hiking and biking or even just a casual stroll. If your family enjoys the outdoors, this is the place to be. 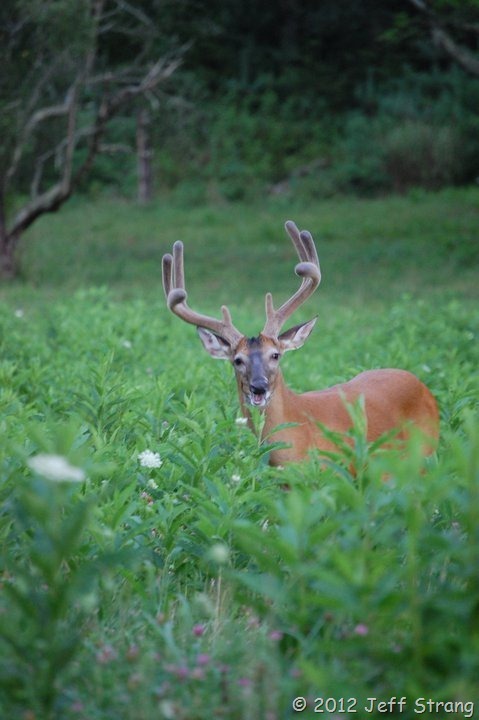 You may be lucky enough to see a black bear or two, young bucks, fawns and does and possibly a turkey or two! On several occasions we have seen coyote, foxes and hawks as well. On a hike you may see a beaver or an otter. You just never know. 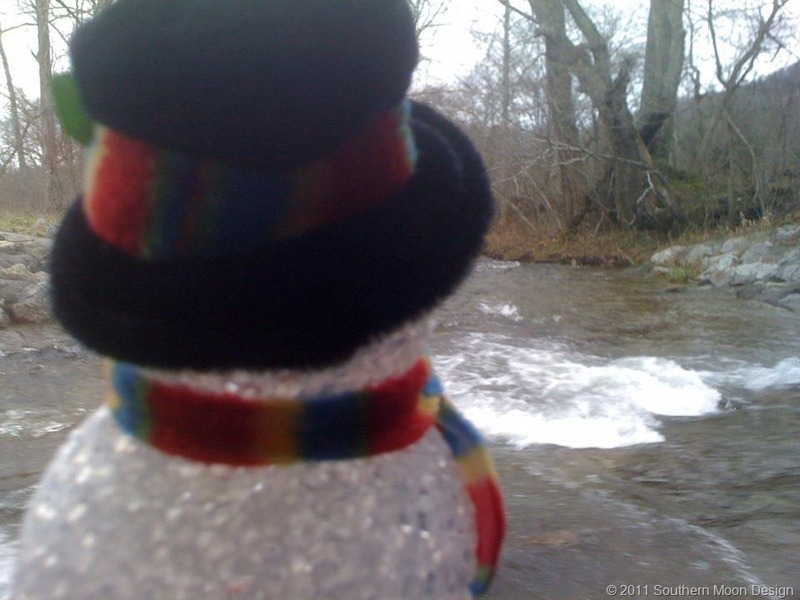 It was really cold the day we went, which is how Frosty likes it, so we didn’t see a lot of wild life like we usually do. It was actually a deer kind of day. There were bucks of several different ages and many does that would come right up to your car. We were excited to see them so close and when three of them decided to walk across the Loop Road in front of us, they each gracefully stooped to crawl under the fence instead of jumping! We were all so disappointed at their laziness! Later on we were lucky enough to see a couple of does leap over the fence in front of us. What a beautiful sight that was! A favorite place for many is the creek that runs right over part of Sparks Lane. The water is so cool and refreshing in the summer. When there has been a lot of rain, you’ll have to be careful because the water tends to rush through and have a bit of a current. 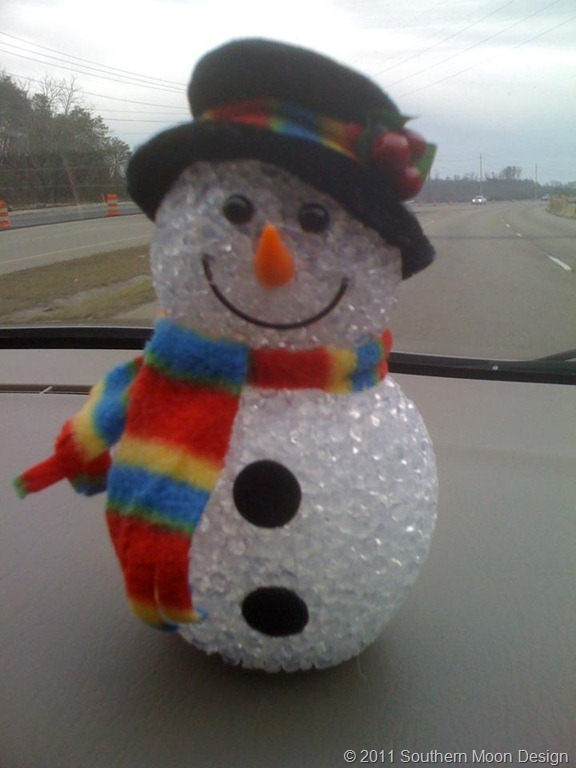 It seemed a little unsettling to Frosty as he looked out the window at it. The water was high enough to reach the bottom of the car and you could feel it sloshing under the floorboards! Dad was our driver and was careful to get us to the other side without the car slipping once. I think we all let out a quiet collective sigh of relief once we were on the other side. 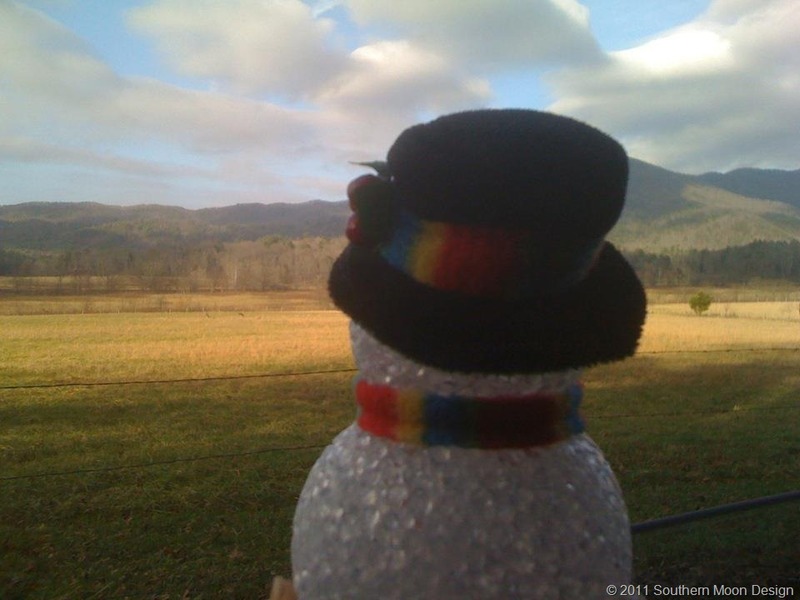 I think we can all agree that the views around Cades Cove are breathtaking. Years ago, a group of families settled here and were, for the most part, self-sufficient. There are churches and graveyards tucked away all over the area. There is a watermill at the halfway point as well as various cabins (many are reconstructed) on the very spot where families once lived. You will find that this valley is rich with heritage and history that is worth checking out. And it is a wonderful place for shutter bugs with an itch for building their portfolios. We have had many wonderful moments catching black bears, coyotes, deer and the stable horses on camera. The Park Rangers are willing to share the history of this magical place with you and a Tour Book is available at the beginning of the Loop for a small donation. We love going to this little spot of Heaven in the Smokies and hope that you will fall in love with it as well. It is so peaceful here no matter what time of year you come. In the fall, the valley is a kaleidoscope of reds, oranges and yellows and in winter, the white blanket glistens like jewels in the sun. During the spring and summer the blackberry bushes are in abundance and the birds sing their hearts out. What a magical place this is! Take the time from your busy schedule and take in the view. Cades Cove is an excellent day trip and well worth the drive. It may become one of your most favorite places to visit.